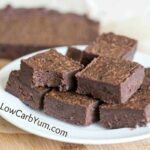 Chewy low carb sugar free chocolate chip pecan blondies that are quick and easy to prepare. No one will guess that these cookie bars are sugar free. 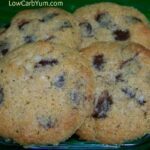 Are you in the mood for something sweet, other than a traditional low carb chocolate chip cookie? 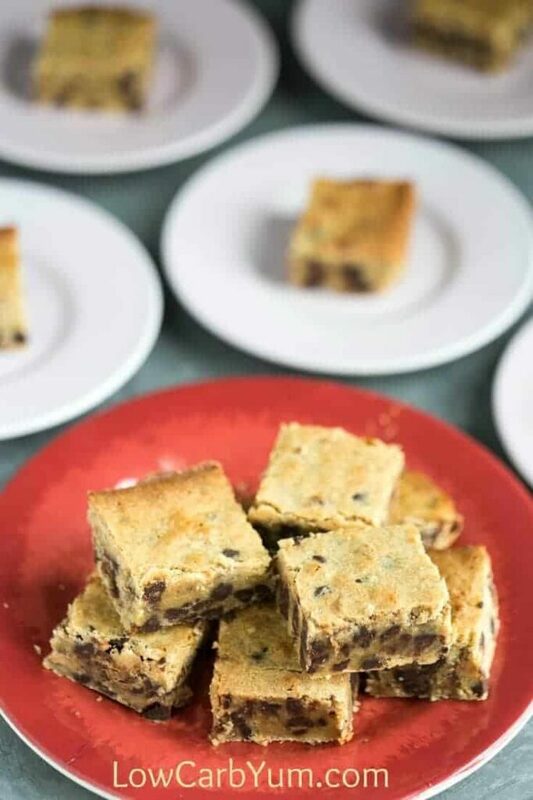 Then these chocolate chip blondies might be just what you’re looking for! 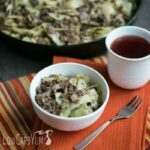 This is a recipe I modified from the Low Carb Friends forum. 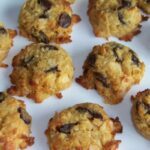 I used ChocoPerfection chocolate chips since they do not cause the stomach distress like the other sugar free chocolate chips sweetened with sugar alcohol. Unfortunately, these ChocoPerfection sugar free chocolate chips have been discontinued. 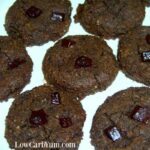 I have since started using Lily’s All-Natural Dark Chocolate Premium Baking Chips. Using the PolyD or VitaFiber and blackstrap molasses results in a chewy bar similar to the bars made with chocolate chip cookie dough. 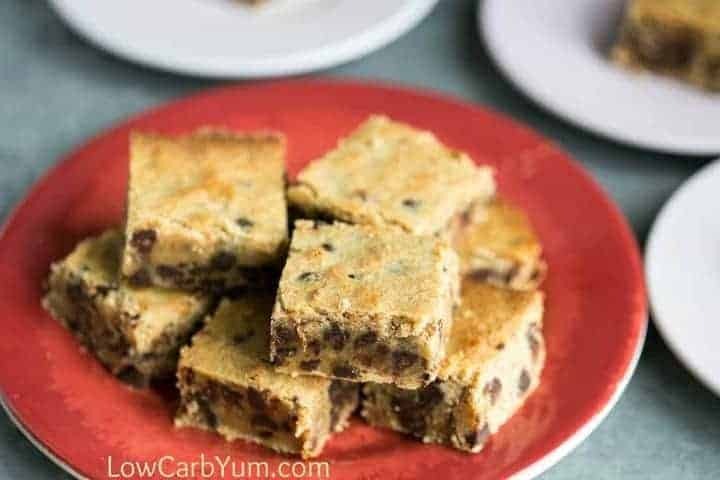 These low carb chocolate chip pecan blondies are quick and easy to prepare. No one will guess that these cookie bars are sugar free. 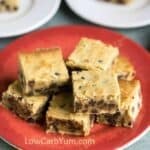 When I first made these low carb chocolate chip blondies, I used Carbquik as the flour. 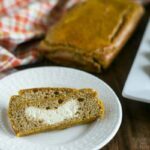 Since moving to a gluten free diet, I’ve been using almond flour and coconut flour instead. I’ve also tried the recipe using the LC Foods Gluten Free Baking mix. 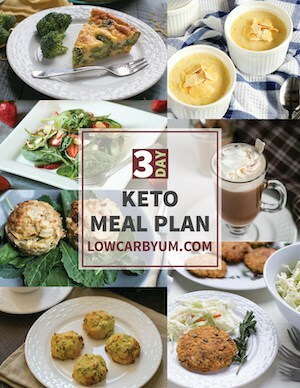 The recipe works with any of these low carb flour replacements. 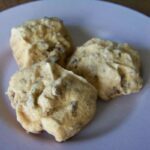 You could even try the Low Carb Bisquick recipe by Maria Emmerich. 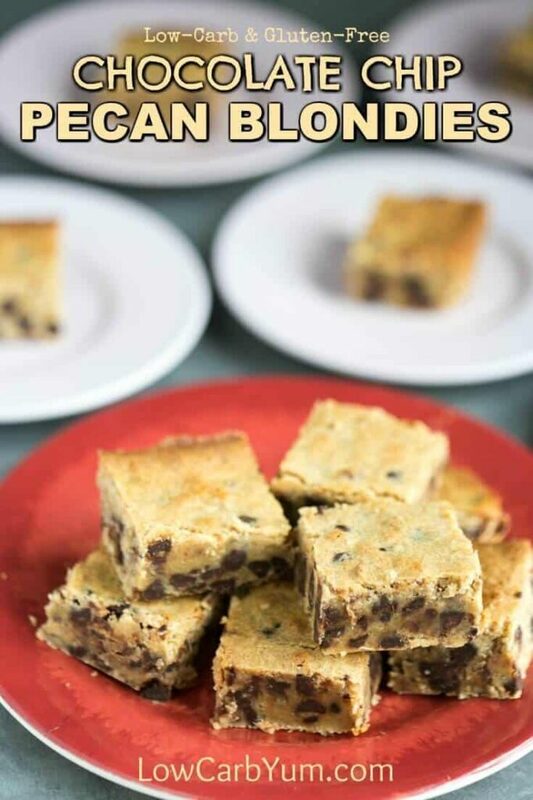 The texture of these pecan blondies are very similar to ones made with sugar. If you leave the polydextrose or VitaFiber powder out, they will not be as chewy. I prefer the VitaFiber because it doesn’t upset my digestive tract like polydextrose can. 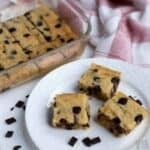 I bake this chocolate chip sugar free blondies recipe in an 8×8-inch pan. Then, I cut them up into 16 squares. They are very rich so one is plenty to satisfy a craving for a sweet treat. 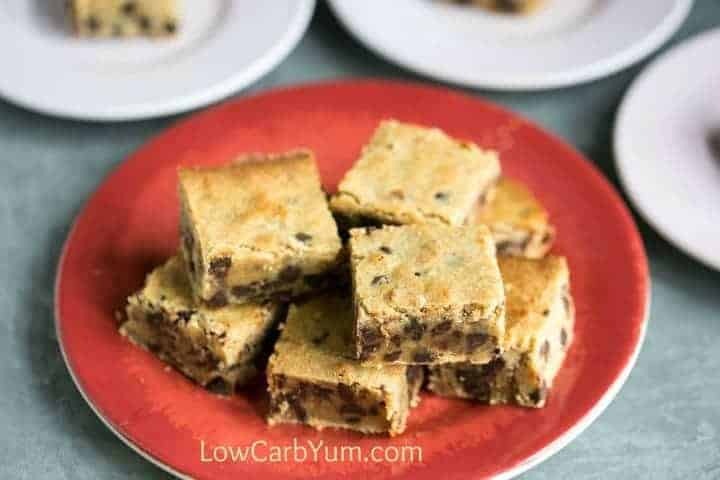 Chewy low carb gluten free chocolate chip pecan blondies5 that are quick and easy to prepare. No one will guess that these cookie bars are sugar free. 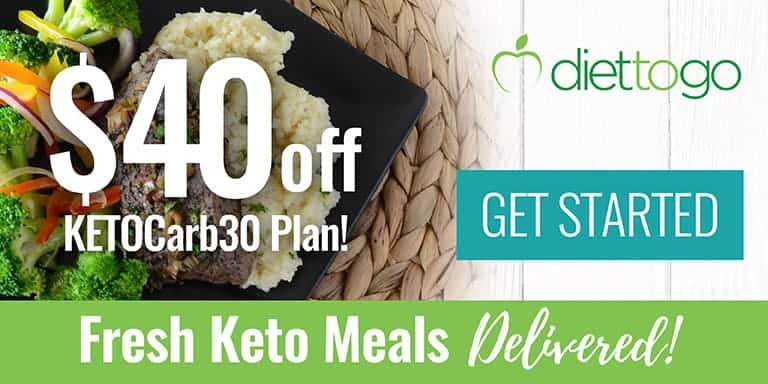 In a small bowl, blend the Carbquik and polydextrose; set aside. 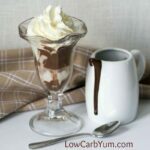 In a medium bowl, beat the butter, sweetener, molasses and vanilla until creamy. Add the eggs and beat well. Add the dry ingredients and blend on low speed just until blended. Stir in the pecans and chocolate chips. 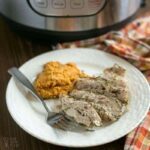 Spread in a greased 8×8 inch pan. Bake at 350ºF for 25-30 minutes or until golden brown all over, checking after the minimum time. Cool in the pan on a rack at least 30 minutes before cutting. 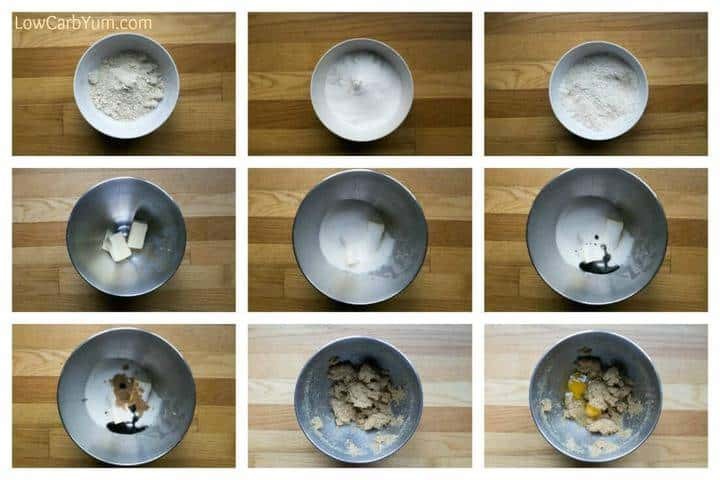 You can make your own homemade baking mix by using 1 cup almond flour and 1/3 cup coconut flour.